16-year-old Donavia Walker is a true inspiration. She may have been born with no arms because of a rare condition. As a result, many folks didn’t expect much from Donavia. But this armless girl isn’t letting that, or anything else, stand in her way! Nicknamed Angel by her grandmother, Donavia can do just about anything the average teenager can do. She just does it all without arms. And this inspiring young lady has even become an outstanding army cadet in the JROTC. Check out her real-life overcomer story below! A rare disorder affecting limbs called Bilateral Amelia caused Donavia to be born without arms. And it came as quite a shock to her mother, Tisa Jones. Tisa had no idea what was going on. “I’m asking my mom and my aunt, ‘What’s wrong with her?’ and then I looked over at them and they are crying,” Tisa said. Doctors told the frightened mother to relax. But naturally, she couldn’t without knowing her baby girl was okay. “I took a glance over and I saw one of her arms were missing,” Tisa said. But it wasn’t just one arm. Doctors revealed that she’d given birth to an armless girl. Her daughter’s condition came as a shock to Tisa. At no point during the pregnancy had anyone alerted her that her baby wasn’t forming arms. But of course, arms or no arms, Tisa loved her baby girl like crazy! “At that point, I didn’t care. I just wanted my baby so I could go home,” she said. It didn’t take long for Tisa Jones to realize her daughter was different. Not because she didn’t have arms. It was Donavia’s drive that truly set her apart from your typical baby. Donavia began developing her own techniques for navigating this world almost right away. Instead of crawling, she scooted around on her bottom. And as she continued to grow, Donavia kept figuring out how to use her feet to do everything people with hands do. Donavia’s family knows she can do anything she puts her mind to. But all too often, the world underestimates this armless girl. “People would put me down because they didn’t think I could do as much as I can,” Donavia says. But every time Donavia hears the words “you can’t,” she finds a way to prove them wrong! “I was like, ‘I can get it with my feet. I will find a way,'” she says. 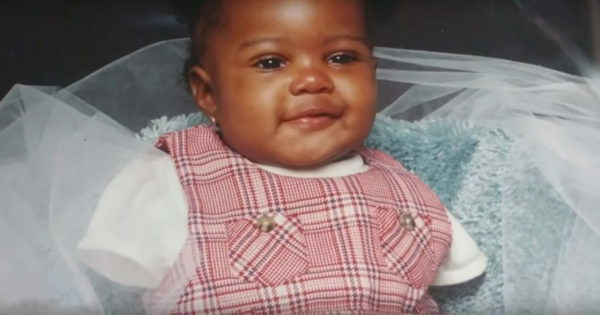 Now at 16, Donavia Walker continues to amaze and inspire all she meets. She’s found ways to do everything the average teenager does, from driving to texting (never at the same time, of course)! Donavia played football at school for three years and even joined the cheerleading squad. But with her incredible drive, one of her greatest accomplishments has been becoming a squad commander in the Junior Reserve Officers’ Training Corps (JROTC). You can’t help but feel inspired watching this armless girl excel at anything and everything. Donavia’s fellow JROTC cadets feel the same way. As for Donavia, while she’s glad to inspire others, she’s just being herself. What a blessing and inspiration Donavia is to this world! The post 16-Year-Old Girl Born Without Arms Proves She Can Do Anything She Puts Her Mind To appeared first on GodUpdates.